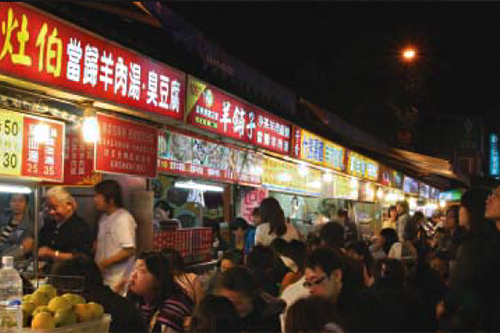 Next to these Chinese delicacies, the enormous variety of typical Taiwanese snacks is unique in the world and most perfectly illustrates the important place that the food culture takes into the lives of the Taiwanese people. 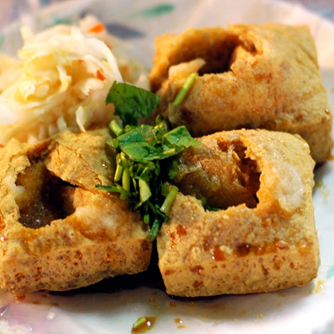 Famous and unique Taiwanese snacks range from oyster omelets to fried rice noodles, tempura, Tainan Danzai noodles, Taiwanese spring rolls, rice tube pudding, and braised pork rice. Food is cheap and delicious, and by no means inferior, while each specialty gives you an insight in the people of the area it originates from. 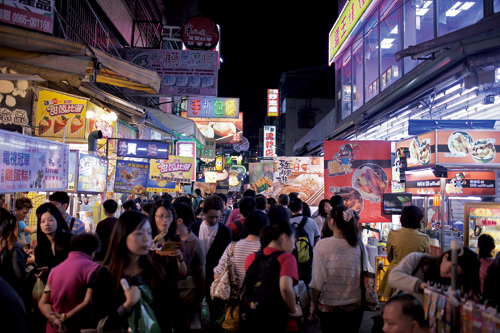 Typical Taiwanese snacks are found everywhere, but Taiwan's night markets in particular, each night market having its own traditions and characteristics, are the places where these snacks can be found in abundance. Trying out these snacks, tourists will be able to learn about different specialties, cultures and people from different areas, adding a whole new perspective to traveling. 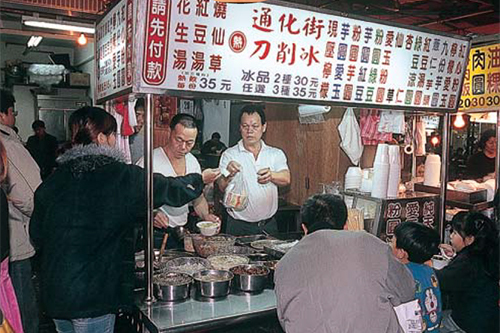 The cuisine in Keelung Temple street night market is very famous, for example: pot-edged pancake soup, shaved ice, Tempura, fried sandwiches, bean noodle thick soup, and shrimp Taiwanese ball. Location: The cuisine stands on Ren 3rd Rd. near the Dianji Temple in Keelung City and on Ai 4th Rd. 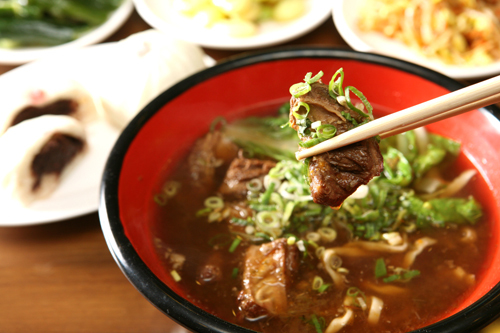 There are various Squid Thick Soupcuisine in the night market, including steak, hot stuffed dumplings, little cake wrapped in big cake, sliced noodles, liver soup, squid thick soup, oyster omelets…etc. Location: Along Dadong Rd., Danan Rd., Wenlin Rd., and Jihe Rd. 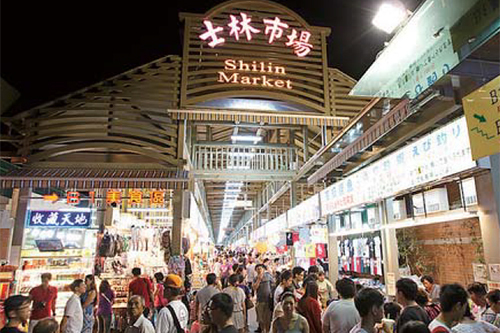 This is the first tourist night market in Taiwan, and the total length is about 600 meters. There are many herb-steamed sparerib restaurants here, which provide good opportunities for nourishment in winter. Location: Intersection of Sec. 4, Bade Rd. and Fuyuan St. in Taipei City to Ciyou Temple on Bade Rd. 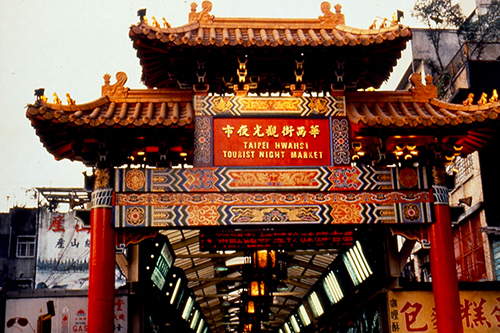 This is the most famous tour night market in Taiwan, which attracts many foreigners and natives for sightseeing. The famous cuisine includes snake meal and snake wine, pot-edged pancake soup, salty rice pudding, fresh water turtle meal, seafood, etc. You can go eating and shopping at the same time. 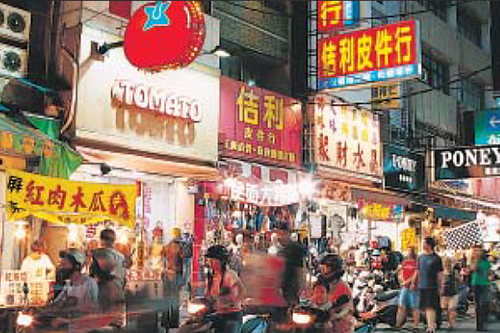 There are plenty of groceries sold on Linjiang Street, the way to get there is to go on Jilong Road and turn to Linjiang Street, then pass Tonghua , which is the part with stores of clothes and quilts. 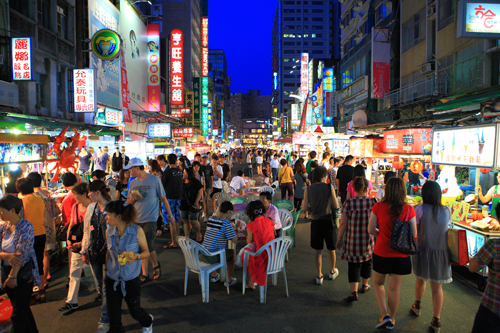 Located by the Datong District roundabout, this traditional-style night market specializes in mouthwatering Taiwan snack foods. 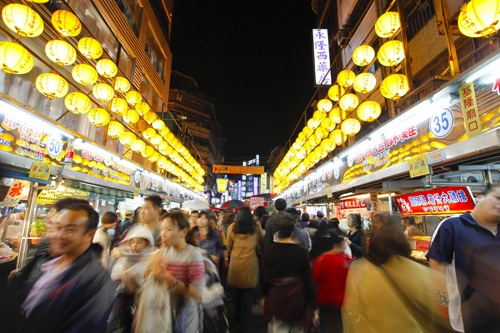 This is the first night market in Taipei to separate pedestrian and car traffic, making it easier for visitors to enjoy the food and shopping attractions here. "Low prices, all included” is the main feature, and it sells several of cuisines, clothes and accessories. Thousands of venders gather here, and there is various cooked cuisine. 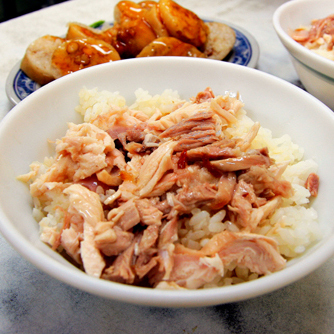 Among these cuisines,” fountain chicken rice", "Kuo-jing-chen flat noodles soup" and "fried preserved cabbage and shrimp egg" are the famous dishes. 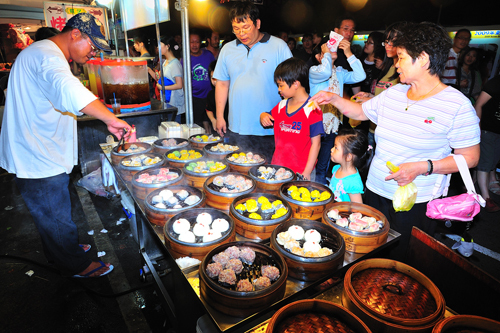 Garden Night Market is a large and conveniently located night market with an extensive array of tasty Tainan specialty foods. The wide selection of clothing, accessories and other items further add to the popularity of this tourism hot spot. 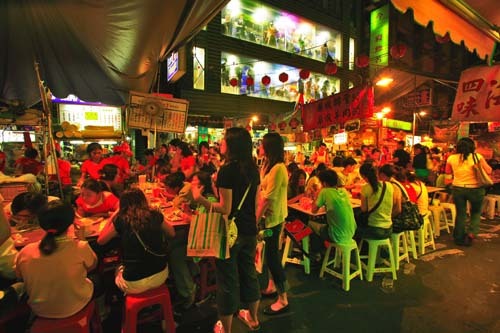 Dainties of all lands and seas, food and beverage, special products are all available here, and the plenty of flavorful food of Liuhe Night Market is famous in Taiwan. 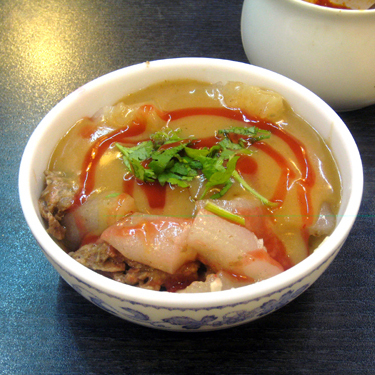 Among these cuisine, papaya milk, salt-steamed shrimp are the main feature. 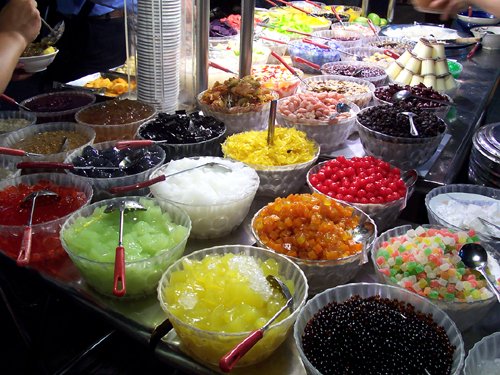 Jelly fig ice, Taiwanese fried chicken, rice with chicken, beef noodles, grass tea and other tasty traditional snacks have made it a most favorite night market among the locals as well as a must-visit destination for visitors.The market is especially packed on weekends and holidays. The native cuisines including salty rice macaroni, smoked ducks, meat thick soups ,longfeng legs, tofurolls ,thick rice noodles, seafood, sausage stuffed pork and sweet potato powder, sausage stuffed tofu, oyster omelet…etc. Location: At the center of Luodong Township and around Zhongshan Park in Yilan County.